Could you print out a necklace? 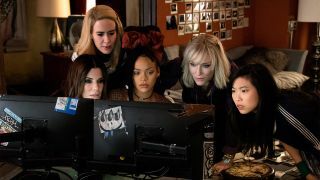 Knowing the difference between the real thing and a fake is key in Ocean's 8 so it's apt that we check out the realities of what we see in the movie in our new regular series where we ask experts in different fields to tell us what's verified reality and what's a pale imitation of the scenarios we see onscreen. Here we query the central premise of being able to knock out top quality faux diamond piece jewellery with tech in Ocean's 8. Sandra Bullock’s heist team produce a 3D printed replica of a priceless necklace to replace the real thing. Possible or high-carat nonsense? From the team’s first step in producing the replica – using glasses to 3D scan the necklace – we come up against the realms of impossibility. Firstly, the glasses wouldn’t be able send data from Cartier’s subterranean vault. Secondly, getting such an accurate and detailed scan of the necklace, from a single angle, first time around, wouldn’t be possible with today’s high-end scanners, let alone a pair of glasses. The materials used to make the necklace present further issues. The metal they use is Zirconium. It looks very similar to the metal of the original necklace but has a very high melting point – 1855oC to be precise. This is significantly above the capability of current SLM or DMLS (metal) 3D printers and will be for some time yet. Having printed the metal, the team then move on to creating various diamonds and jewels. Crystal printing of this type doesn’t exist quite yet. At best it would be a semi-transparent resin and create an easy to spot fake. So for now, this tech is certainly not true to life.